Our marketing tasks aren’t always performed from behind a desk or in front of a computer. Sometimes, in fact, the only way to get the results you need is by going out there and getting your hands dirty… or cold, as was the case with a product photo shoot for Vnomics Corp., providers of True Fuel™, an advanced analytics solutions that enables fleets to improve driver and vehicle performance in real-time. Located in Victor, N.Y., Vnomics needed new photography for their True Fuel™ product, a modem-sized device that rests on the driver’s dashboard providing real-time feedback as they operate the vehicle. The photos needed to show True Fuel™ in its actual working environment, the cab of a tractor-trailer as it cruises down a highway (preferably a sunny one, as per the client). The only problem was our tractor trailer was sitting in a blustery, snow-covered upstate New York parking lot where the December sun hadn’t appeared in days. Getting the perfect shot in a natural environment posed many problems: Light while driving is inconsistent at best, our roads at the time were salt-covered and lined in dirty snow, and there were safety concerns about walking around the cabin of a moving vehicle while unsecured to get the right angle for the picture. Instead of taking any unnecessary risks, we used our skills and experience to deliver exactly what the client wanted, quickly and efficiently. Without even having to put the vehicle in gear, our photographer was able to capture well-lit shots of the product in use. To aid in this, a grip, or lighting specialist, stood outside the cabin (attempting to stay warm as the snow flew) and held a reflector to bounce natural light into the cabin where the photographer needed it. We then took the raw image, which looked out the windshield from the back of the cabin, and manipulated it in post-production. We replaced the dirty snow-filled parking lot we shot the photo in with an image of a highway in Wyoming. The resulting photo captured the product as it is intended to be used and was just what the client needed. Our product photography was ultimately used by Vnomics in press releases, company booklets, magazines, and other marketing materials. At left, the original photograph as taken with no editing. At right, the modified photography with modifications. 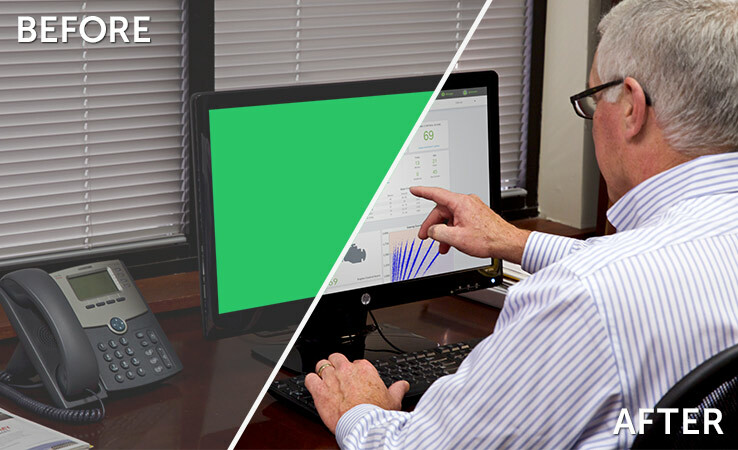 Vnomics also needed imagery of a manager using their product software on his desktop computer. Unfortunately, at the time of the photo shoot the software’s graphical user interface (GUI) was in the process of being redeveloped. Time constraints dictated we take the image before it was slated to be completed. We overcame this obstacle using methods similar to those employed in our tractor-trailer photoshoot. Weeks after taking the photo, once the software was fully completed, we were able to simply go back and insert the software’s GUI into the image. This created a seamless photo of the product being used by a company manager, with no one being the wiser that he was actually staring at a blank screen! At left, the original photograph as shot by our photographer. At right, the modified photograph. Additionally, the client wanted standalone product photography to complement their marketing efforts. The image had to be used across a variety of situations and, therefore, needed to be shot on an all white background that could be swapped out with whatever other background was needed by the client. It was also important to convey the sense of scale of their TrueFuel™ product, as drivers and fleet managers are always wary of adding devices inside their vehicles. To that end, we included a truck key next to it while shooting. We shot a number of high resolution product images for Vnomics that worked seamlessly with whatever background they placed it on, both online, in print, and in their press-kits. If you’re interested in capturing professional imagery of your product or service, reach out to us! We’re happy to speak with you about your needs and offer our recommendations.